Paul George goes up against Pacers. Giannis Antetokounmpo battles DeMarcus Cousins and Anthony Davis, while the Rockets just keep winning. Paul George came back to Indianapolis and struggled offensively against his former team, but the Thunder picked up the slack to earn the win. DeMarcus Cousins and Anthony Davis outplayed Giannis Antetokounmpo in the second half to secure a Pelicans' victory. While the Rockets continue to roll, the Grizzlies can't buy a win, and the Bulls have caught fire. Paul George returned to face his old team and got off to a bit of a slow start. After getting roundly booed during the introduction, George took just one shot in the first quarter and scored two points as the Thunder went down 27-21. The score remained relatively close in the second, but Oklahoma City center Steven Adams dominated the final 3:49 of the half, scoring seven points to put the Thunder up five at halftime. Indiana came out of the break to quickly reclaim the lead, going on an 11-2 run to jump ahead by four. But Oklahoma City unleashed a 9-0 run later in the quarter to take a four-point lead. The Thunder extended that number to 11 with 4:45 in the game, but the Pacers battled back, cutting the lead to one with 40 seconds remaining. Oklahoma City guard Alex Abrines tipped a shot in to make it a three-point game. The Pacers had a chance to tie the score, but George stole an errant Indiana pass and cemented the victory with two free throws. Adams led the Thunder with 23 points and 13 rebounds. Russell Westbrook dropped 10 points, 17 rebounds, and 12 assists, while George had 12 points on 3-14 shooting. Over his last five games coming into the matchup, Giannis Antetokounmpo is averaging 32.4 points on 54.2% shooting. Antetokounmpo had 10 points in the first quarter as Milwaukee went ahead 37-32 and then poured in 11 more in the second. The Bucks held a 63-62 halftime lead with plays like this. The score remained tight throughout the third quarter, but back-to-back Anthony Davis' dunks put the Pelicans up two by the start of the fourth. Milwaukee grabbed a three-point lead with 8:01 remaining, but seven straight New Orleans points pushed the Pelicans back ahead. Bucks' forward Khris Middleton answered with a three-pointer to make it a one-point game, but it wouldn't get any closer than that. DeMarcus Cousins led New Orleans with 26 points, 13 rebounds, and seven assists. Antetokounmpo scored a game-high 32 points. Wayne Ellington came off-the-bench for the Heat and caught fire. Ellington drilled 5-5 from deep in the first quarter to score 15 points and boost Miami to a 33-21 lead. Six more points from Ellington in the second helped the Heat maintain a 10-point lead at halftime. Portland trimmed the deficit by one in the third quarter, but stormed ahead in the fourth. A 16-7 Trail Blazers' run tied the game 86-86 with 6:48 left. The two teams traded buckets and the lead until Portland All-Star Damian Lillard scored five straight in the final 1:40 to put the game away. C.J. McCollum had a game-high 28 points for the Trail Blazers. The Grizzlies' hope of ending their four-game skid got off to a terrible start. Memphis shot 5-21 from the field in the first quarter and scored just 12 points. After missing nine games, Wizards' All-Star John Wall finally returned to the lineup to help Washington take a 10-point lead after one and 12-point lead at halftime. Wall led the Wizards with 11 points in the first half. Marc Gasol scored seven points in the third quarter to help the Grizzlies get back into the game. Memphis cut the deficit to three in the fourth and then grabbed the lead 67-65 at the 8:53 mark. But a 13-0 Wizards' run gave Washington back a double-digit cushion. Bradley Beal had 18 points and seven assists for Washington. 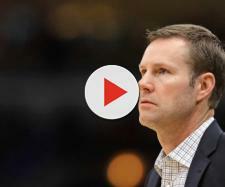 Despite rookie sensation Donovan Mitchell scoring 10 points in the first quarter, the Bulls raced out to a six-point lead in pursuit of their fourth win in-a-row. Chicago managed to hold on to a one-point edge at the break. Nikola Mirotic led the Bulls with 14 points and five rebounds in the first half. Mitchell went on a scoring binge in the third to give Utah a seven-point advantage midway through the quarter, but Mirotic dropped 13 points in the final 4:37 to put the Bulls back ahead. The Jazz tied the game early in the fourth 78-78 and then again 90-90 with 4:58 left. But Chicago would never surrender the lead. Mirotic had 29 points for the Bulls, while Mitchell had a game-high 32. Raptors center Jonas Valanciunas got off to a strong start versus Phoenix, scoring 10 points and hauling down four rebounds to help Toronto to a 37-31 lead. The big man added five more in the second as the Raptors led by six at halftime. Suns' reserve Troy Daniels kept Phoenix in the game with 14 first-half points. DeMar DeRozan exploded for 18 in the third quarter to extend the Raptors' lead to 92-79. But in the fourth, Phoenix went on an immediate 10-0 run to cut the deficit to three. Toronto did clap back to go up by eight, but three more times the Suns would make it a one-possession game. The Raptors responded accordingly each time to secure the win. DeRozan had 37 points for Toronto, and Daniels dropped 32 for Phoenix. James Harden is a top MVP candidate, but it was his running mate, Chris Paul, who had an impressive stat line. Paul had 11 in the first quarter and 17 at halftime as the Rockets took a 63-49 lead. Houston's lead swelled to 22 points in the third quarter, and it was never a game in the fourth. Paul had 31 points and 11 assists. The one bright spot for the Hornets was that Dwight Howard had 26 points and 18 rebounds. After missing the game on Monday (Dec. 11) against the Bulls, Kyrie Irving returned to the Celtics' lineup and dropped 11 points in the first quarter. But Nuggets' guard Gary Harris scored 11 points as well to give Denver a one-point edge in the first. Boston turned their offense from warm to hot in the second quarter, scoring 38 points and taking a nine-point halftime lead. The Nuggets backcourt of Jamal Murray and Harris came out in the third quarter and combined for 21 points to slash the deficit to five going into the final period. Denver would cut the lead to three early in the fourth, but a 9-0 Celtics' run put Boston ahead for good. Irving had 33 points and seven assists. Harris finished with a game-high 36 points. The Clippers came into this matchup having won two straight games, but their prospects for three got off to an ominous start. Los Angeles shot just 6-23 from the field as the Magic raced out to a 24-13 lead. The Clippers completely flipped-the-script in the second quarter. Reserve Lou Williams poured in 13 points to help Los Angeles outscore Orlando 32-16 to take a five-point halftime lead. The Clippers nudged that number to six in the third, and 6-2 run put Los Angeles up 10 early in the fourth. The Magic would never get any closer than seven before losing by 11. Williams had 31 points and eight assists for Los Angeles.